Parents of Isaiah Aguilar: Lisa Gonzales and Richard Aguilar. UPDATE 02/19/13: Fox 29 reports (in the video) what we had suspected. There were two pit bulls in the neighbor's yard (See: related photo). The news group also reported that the female pit bull that attacked and killed Isaiah Aguilar had recently killed another pit bull. "The female that did this killed the Dad of the dogs," according to Isaiah's mother, Lisa Gonzales. She also said the animal ate most of her own puppies. 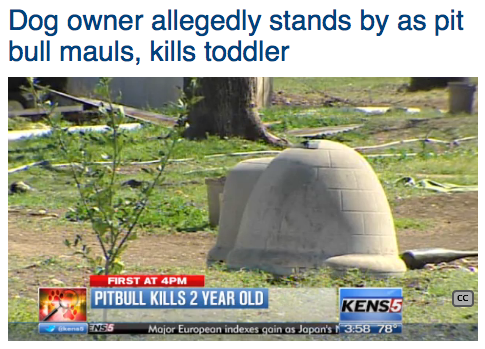 "That dog attacked its own litter … and my son," Gonzales said. By the time the boy's father, Richard Aguilar, reached him he was no longer breathing. A neighbor in the area performed CPR as the boy's family waited for police to arrive. The child was transported to a hospital in nearby Uvalde, but did not survive his injuries. The pit bull is currently being held in quarantine in Uvalde. 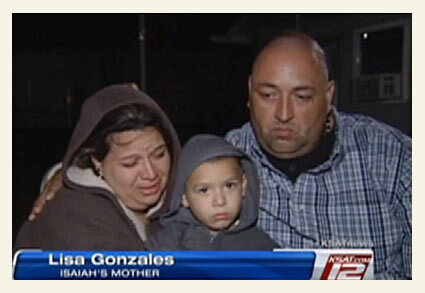 Isaiah's mother, Lisa Gonzales, told police she was heartbroken that nobody came to help her son. "I just want all this to be a nightmare," she said. 1Remember, in Texas, you can't watch your dog attack and "do nothing." THERE IS NO PLACE FOR THESE ANIMALS IN NEIGHBORHOODS ANYWHERE !!!!! Let's see, we're only seven weeks into this New Year. And, what is it, 4 DBRFs already? I agree with Decatur. Pit bulls have NO place in ANY neighborhood. Little kids are being picked off in their neighborhoods. I'm sick of people suggesting that it is normal that dogs perceive young children as such a horrible threat that they must kill them. I'm sick of people suggesting that when they grew up, they never ventured outdoors without a parent accompanying them. I'm sick of people suggesting that it is ok to keep keep lethal things in their yards so that a child who ventures into the neighbor's yard is making a lethal mistake. I'm sick of people saying these owners are responsible, did nothing wrong, or did "everything they could do" by leaving their pits outside unattended behind a fence. Even pit bull proponents say a responsible pit bull owner should never leave their pit bull outside unattended. "He looked out the door and my baby was laying right there in front of his door. He shook his head "no" and he shut the door and not one time did he open it back up," said Lisa Gonzales. Another week another death by pit bull. Yet the nutters think a baby chasing their balloon into another yard is worthy of the death penalty. These folks are definitely wired differently then normal people.
" I'm sick of people suggesting that it is normal that dogs perceive young children as such a horrible threat that they must kill them. I'm sick of people suggesting that when they grew up, they never ventured outdoors without a parent accompanying them. I'm sick of people suggesting that it is ok to keep keep lethal things in their yards so that a child who ventures into the neighbor's yard is making a lethal mistake." Are the authorities ever going to "get it"? The 20 Year CDC Report covering 1979-1998 cited 330 DBRFs from all the breeds of doggiedom. He we are 14.25 years later, and Pit bulls and Rottweilers have already picked off 266 Americans! The are on pace to exceed the 330 figure in the next few years. The conclusions they came up with were either incompetent or lies. Not sure which is worse. *Disclaimer…You Can't Make This Stuff Up! At this point I bet it is more likely they would outlaw balloons before anything is done about pit bulls. With the latest update here on the blog, how will the nutters cry of "animal aggression is different then human aggression" be handled? So imagine you own these dogs- yet you STILL keep an animal like this that has killed other pets and its own litter? Normal pet owners would not do that. So there was a fence with a large opening and the fence in the video was not a good fence for any dog. What a disgusting situation for little kids to grow up around. Pit Bulls mean more to these people that human lives !!! So the other adult pit was this killer's sibling and she killed their "Daddy" and then ate the litter of puppies she had. So this neighbor was backyard "INBREEDING" !!! This hasn't been stated yet in news reports medic and it may never be. We're sure everyone in the small town of Sabinal knows. Notably, the address (block) of the attack was not listed in news reports either. This is rare in a fatal dog attack case. News reporters, if nothing else, usually capture a street sign on the block in their TV clips. This can quickly lead to Google Street Views and a search of county property records. Interestingly, no such tips have occurred in the Sabinal fatal dog mauling.